I put a deposit down on the new Nucleus custom action made by American Rifle Co. a couple weeks ago for a new build. I've had a bunch of Hornady 75 gr AMax bullets setting on the shelf for several years that don't get used. The OAL is too long to shoot out of an AR-15 magazine,and my Savage 12 223 doesn't shoot them as well as it does a 75 gr BTHP bullet. For years,I've debated on building a fast twist 22-250 or 22-250 AI to shoot the heavy .224 bullets,but since the the 6.5 Creedmoor has become a main stream commercial cartridge there have been several people wildcatting it with very good results. So I decided to build a 22 Creedmoor,and have the performance of the 22-250 AI without having to fire form the cases,or buy custom dies. I can use my 6.5 Creedmoor dies,and just swap out the neck bushings. Plus,AlphaMunitions is going to produce 22 Creedmoor head stamped brass,so I don't have to neck down any brass. As with most overbore cartridges,barrel life is pretty short- 1000 to 1200 rounds before you loose accuracy,so I won't be putting a top shelf barrel on it. Very few barrel makers have a reamer for it,but I talked with John at Ragged Hole barrels and for $50 more than the price of the barrel,They will buy a reamer. That saves me over $100 since I don't have to buy one. They use Wilson Arms & X-caliber blanks,and I'll probably go with the Wilson Arms for this rifle. I shouldn't have any problem getting it to shoot 1/2 moa or better with my loads. I'll loose a little velocity since I will go with a 20" tube,but I hang a 9" suppressor off the end. I should still get around 3200+/- fps with the 75 gr AMax out of it! That's as far as I've got on my plans for this rifle,I have plenty of time to decide/find a stock or chassis - probably a used one,the trigger,and the optics. That’s a fast bullet! Is it comparable to the 223 Valkyrie? HaHa, The 22 Creedmoor case holds around 10-12 more grains of powder over the 6.8 SPC case of the 224 Valkyrie. I've just about decided to get a Manners EH5 stock for this project. I have always wanted a Manners stock, and it will be a good match for this rifle, a lighter weight varmint hunting weight rifle. I'm just waiting on an email about some questions I have about it, then I'll make my decision. What is the diameter of the barrel? Are you using a lighter weight profile on it too? It's a light varmint contour, so it's a little smaller diameter but since I'll chop it down to 20" you won't notice the difference. I changed my mind on the barrel and stock. X-Caliber was running a 25% off sale in April,so I ordered two barrels for this rifle. 1-7 twist 5R rifling,20" long in a Varmint contour. I'll shoot up all the 75 gr AMax bullets out of the first barrel,then probably shoot the 90 or 95 gr bullets out of the other. I got lucky and talked to the right person at KRG for my new stock/chassis. KRG makes a new chassis - The Bravo,but they only make it in right hand versions. I asked them several times if they would put a LH chassis backbone in the outer shell for me,and they always said NO. I started PM'ing Justin from KRG on Snipershide,and he finally made it happen. 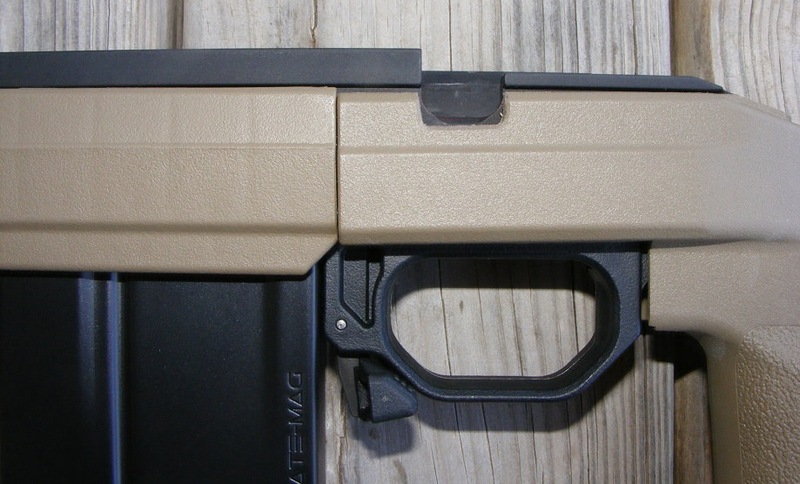 I now have a Bravo chassis in FDE with a LH Whiskey 3 backbone mounted in it,I just have to cut out the slot on the left side of the plastic outer shell for the bolt handle. Maybe by the time the action shows up,I'll have made my mind up on the scope. I was pretty set on buying another Athlon Cronus scope,but now that I've actually handled one of the Revic PMR 428 smart scopes,I may have to save a little more money. This scope is badass,you can load 3 different ballistic programs into it for different bullets or guns. It does everything but read the wind for you,you put in the wind values,and the computer adjust everything else. As you turn the vertical turret the yardage value can be seen in the HUD inside the scope,as well as a canting level,and weather readings. I almost forgot. I bought a Trigger Tech Diamond trigger for this rifle at the NRA convention. I got it for 15% off from TT at the show,now I just have to wait for it to show up,they are way behind in making these triggers right now. Last edited by Txhillbilly; 05-12-2018 at 12:26 PM. Did a little looking. 75gr at 3500 FPS? Damn, you're going to be blowing holes in any varmint you hit. Yep,Glad I don't keep or sale the pelt's,they will be worthless with big ole holes in them. That’s a fast bullet! Have you tried any of the Hornady ELD or Nosler RDF bullets? I shoot the ELD-X bullets in 6.5mm - 7mm - 30 caliber. I don't like Nosler match bullet's,never had much luck getting them to shoot good out of anything. I do shoot a few of Nosler's hunting bullets in my 223's,25-06,and 308,they shoot real good. I broke down and bought a Revic PMR 428 scope today,I had a discount code so I saved $412.50 on it. I can't wait to get this scope and try it out! I'll waste some of my time and post some pics for the 3-4 members that actually participate around here. I cut out the LH bolt handle slot on the new KRG Bravo chassis. Now a bunch of guy's on Snipers Hide want one! 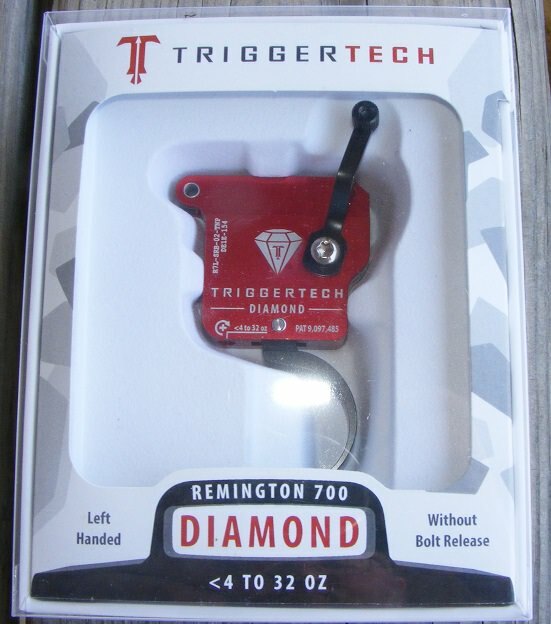 The Trigger Tech Diamond trigger arrived. I can't wait to try this one out. The TT Special trigger I have in my 6.5 CM custom build is super sweet,and I can turn the Diamond down safely to 4 ounces. Now for the big news,The Revic PMR 428 smart scope. I think this scope is going to really change things. It can do everything ballistically on it's own except range your intended target,and wind direction & speed. The shooter must input the wind information,and range the target,but then you just dial the elevation turret to the heads up display inside the scope,and either hold off or dial the windage turret for the wind adjustment. You can use the scope just like any other,without turning on the electronics,so if the battery goes dead while your hunting it doesn't ruin your hunt. You can download up to 3 different ballistic programs into the scope,so you can shoot 3 different loads out of the same rifle,or use the scope on different rifles. This is a top shelf optic,the glass quality is the same as any other high end optic. This isn't a lite scope,it weighs 47 oz,and basically identical to the Vortex Razor HD Gen 2 scope body/weight. As soon as my ARC M10 rings arrive,I'll mount it on a rifle and try to learn how it functions. I don't expect my Nucleus action or the X-caliber barrels for my 22 Creedmoor to show up for a couple more months. It can do everything ballistically on it's own except range your intended target,and wind direction & speed. it's probably only a matter of time before scopes do everything a shooter needs to be accurate becomes the standard. You are gonna have a world class rifle in a few months, you make me want to max out a few credit cards. I really wasn't planning on going all out on this one, but I have gotten some very good deals on the action, barrels, trigger, and the scope, so it was hard to pass up the savings. I'll be under $5k on this one, so it's way under my last custom build. I'm sure glad that I am single, and lucky that I have everything paid off, so I can build my toys and not get yelled at for blowing my money. Very interesting setup! Can’t wait to see how you like the scope. That definitely makes a difference. I will just have to live vicariously through you on this one, looking forward to seeing the finished product. My X-Caliber 22 Creedmoor barrels arrived today! Just waiting on ARC to make my action now.